Arianna Huffington is a Greek American author, syndicated columnist, and businesswoman. 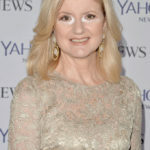 Huffington was the co-founder and editor-in-chief of The Huffington Post, which is now owned by AOL. She was a popular conservative commentator in the mid-1990’s, after which, in the late-1990’s, she offered liberal points of view in public, while remaining involved in business endeavors. In 2003, she ran as an independent candidate for governor in the California recall election and lost. "America is a country ready to be taken, in fact, longing to be taken by political leaders ready to restore democracy and trust to the political process." "The fastest way to break the cycle of perfectionism and become a fearless mother is to give up the idea of doing it perfectly – indeed to embrace uncertainty and imperfection."